Following up on the earlier post to guess the November artist/illustrator. Rachel guessed that it will be Leo Politi and we discussed him some in the comments section there. This year, November 21, would have been his 100th birthday. Jennifer just mentioned she has Song of the Swallows and was wondering if that is the author. Yes, it is! And that is just the tip of the iceburg. Jennifer also mentioned that book is all she has. Most of his books are unfortunately out of print but very much worth finding used or from interlibrary loan if they aren't available to you locally. I find his work enchanting - very rich with cultural traditions and heritage of different ethnic groups in America. They are a great look at our melting pot history starting with the founding of the missions in California. It's still a bit early to officially start this November study but not so when one considers it may take some time to locate more books. Do take the time and effort to seek out a few of his books - you will not be disappointed! Here is a listing of the books that Leo Politi wrote and illustrated. Here is a listing of books that Leo Politi illustrated but were written by other authors. Samples of his art work and illlustrations. The Jim Arnosky Author Fiesta is still going strong around the Ten Kids and a Dog home. 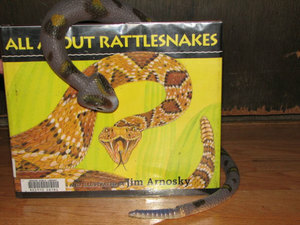 One of the kids favorite books by Jim Arnosky has been Wild Tracks! 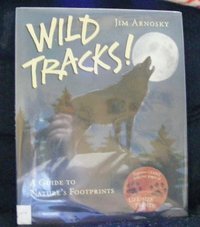 This contains beautiful Arnosky animal illustrations along with life size illustrations of mostly North American animal tracks,tracks that can be found out and about right here in our neck of the woods. After enjoying perusing this book for a few weeks, the time came to start some projects. 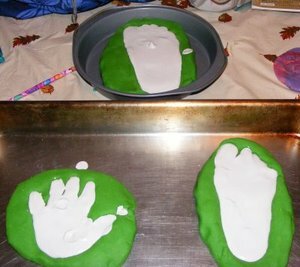 Here is a sampling of the great activities they have been doing that focus on animal tracks. 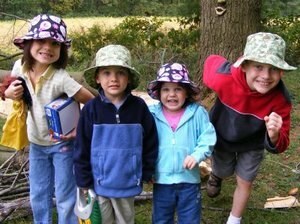 Keeping in the Jim Arnosky nature theme, and wanting to honor our favorite nature guide, Crinkleroot, I made the four littlest kids "hiking hats". 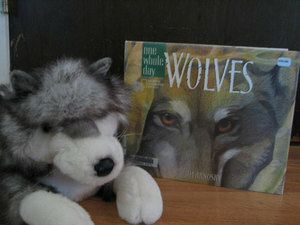 We plan to use them on all of our nature walks, especially this autumn, as we continue enjoying the Author Fiesta. The kids are really enjoying their hats. I used Simplicity #5540 as my pattern. I think they only cost about $3.00 each to make. Several more research forms have been uploaded in this previous post. 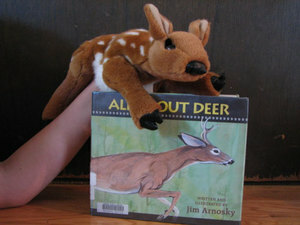 They are All About Manatees, All About Turtles, All About Frogs, and All About Deer. Still working on more. Stay tuned. While the older kids are enjoying the nature study that Jim Arnosky encourages, my littlest kids have been enjoying the many books written for our youngest students. 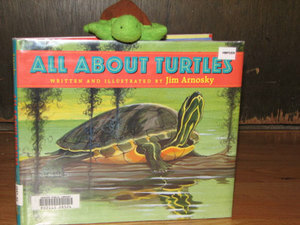 Here is a list of Jim Arnosky's books that are suitable for the toddlers among us. 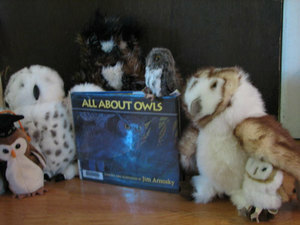 We have been enjoying Crinkleroot's Animals That Every Child Should Know books. Sadly, these books are out of print, but many library systems have them available. 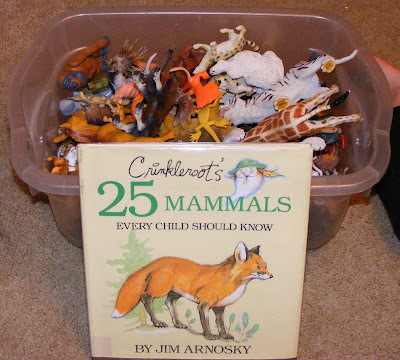 To make this book a little more hands on for Luke and Kimberly, I searched through our animal bucket and found most of the animals featured in the book. 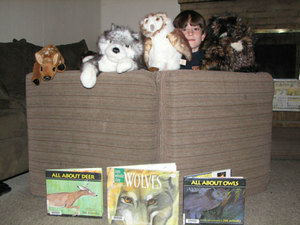 We were missing a few of the animals, so I searched around the house and found pictures of the missing mammals. 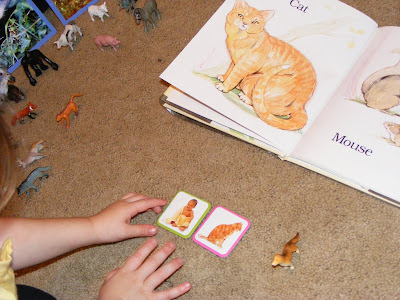 We looked at the page and named the animal in the book and then looked for the matching animal among the pictures and toys I had set out. 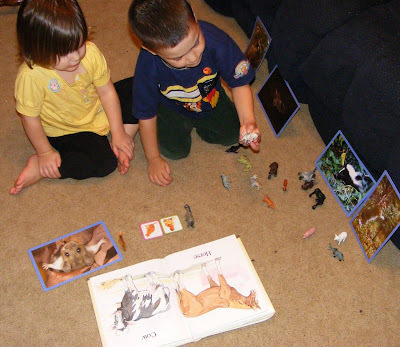 During this time we also made the animal's sound and crawled around and acted like the creature. This also served as a good lesson in taking turns. Something that has to be learned, and learned, and learned. There is nothing worse than a 2 and 3 year old diving on top of each other as they moo like a cow! 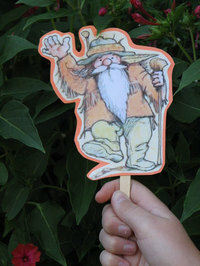 Taking the Crinkleroot Guide concept one step further and also borrowing an idea from Flat Stanley, the famous paper traveler, how about having a paper Crinkleroot accompany your family on this month's nature adventures. We printed an image from the internet (I wanted it bigger but it lost clarity as I enlarged). You could also enlarge a copy from one of the books. Cut it out (we put a construction paper backing on it to make it sturdier and added a popsicle stick handle) and he's ready to go along on nature walks and assist with the studies. Here's where he went with us today. Speaking of Crinkleroot, have you ever wondered about the name? Well, crinkleroot is the common name for a woodland plant (Cardamine diphylla) of eastern North America, having fleshy rootstocks, trifoliolate leaves, and clusters of white or pinkish flowers. His birthday was September 1st. Let's hang on to that last bit of summer stretching into fall. It's a great time for some nature study in our Author Fiesta. 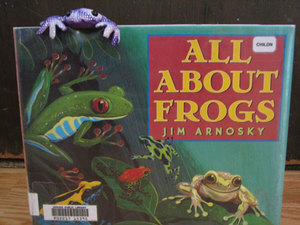 Jim Arnosky is a self taught writer, artist, and naturalist. He is a prolific author and illustrator, with well over a 130 books to his credit. 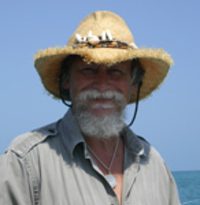 His outstanding work has received many honors and awards including the Christopher Medal, Orbis Pictus Honor, ALA Gordon Award, and Outstanding Science book awards from National Science Teachers Associations. We hope you will join us this month as we hone our naturalist skills and knowledge and share Jim's passion for nature through the books he has written and illustrated. 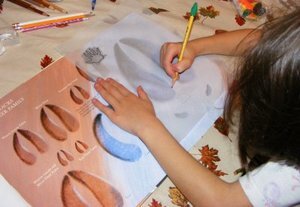 A great place to start is Jim Arnosky's website, which is full of nature facts, coloring pages, and book lists. As we step into a new season in September, well prepped by looking at the gentle transitions of the year with Tasha Tudor, we'll highlight a new author/illustrator. Care to take a guess as to the identity of the September selection?